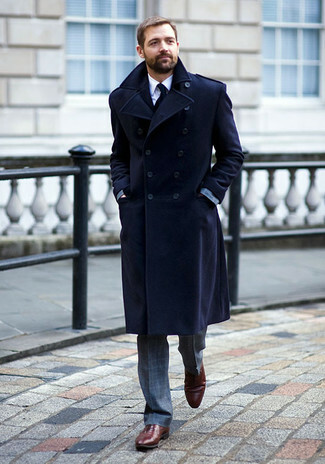 For a casually elegant getup, go for a navy overcoat and navy chinos — these two items the workplace well together. 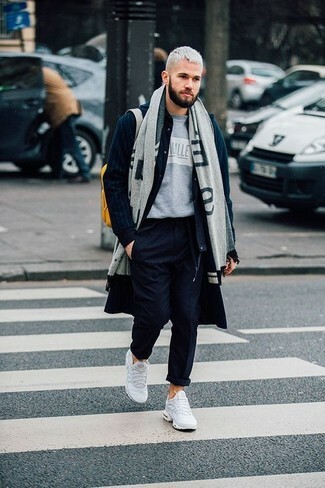 For something more on the daring side to finish off this ensemble, make white athletic shoes your footwear choice. Teaming an Ermenegildo Zegna navy overcoat and a grey check suit is a surefire way to infuse class into your styling collection. Introduce a pair of burgundy leather oxford shoes to the mix and ta-da: the outfit is complete. 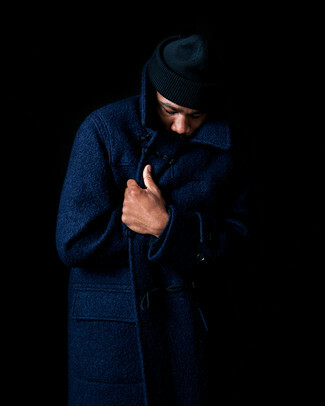 Choose a navy overcoat for a sharp, fashionable look. 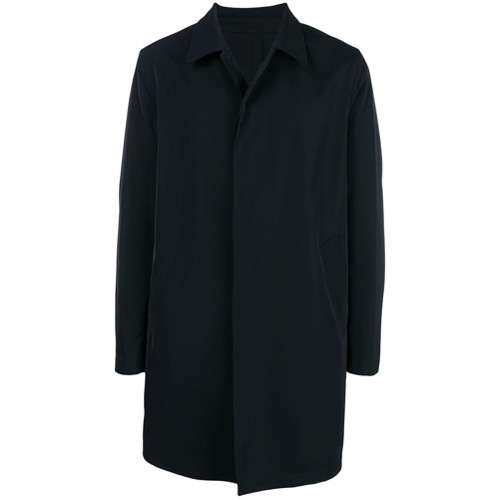 If you're looking for a casual yet seriously stylish look, marry a navy overcoat with blue ripped jeans. As well as very comfortable, both of these items look wonderful when paired together. Play down the casualness of your ensemble with black leather double monks. 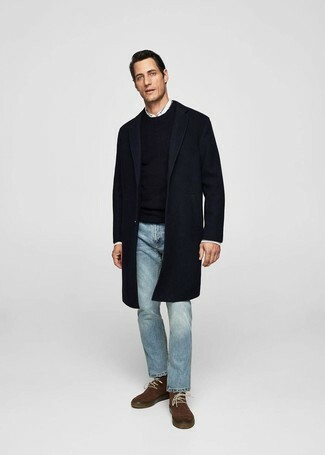 This combination of an Ermenegildo Zegna Single Breasted Coat and blue jeans is super easy to throw together in no time, helping you look dapper and ready for anything without spending too much time going through your closet. Break up your getup with more casual footwear, like this pair of olive canvas desert boots. 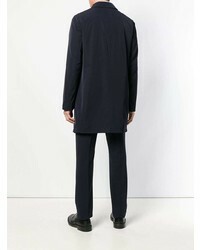 Tap into refined, elegant style with an Ermenegildo Zegna single breasted coat from farfetch.com and brown dress pants. Brown suede loafers will add more playfulness to your look. 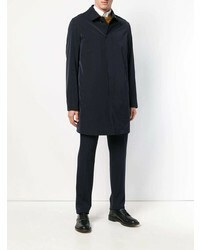 Dress in an Ermenegildo Zegna navy overcoat and charcoal wool dress pants to ooze class and sophistication. Got bored with this getup? Enter dark brown suede oxford shoes to jazz things up. 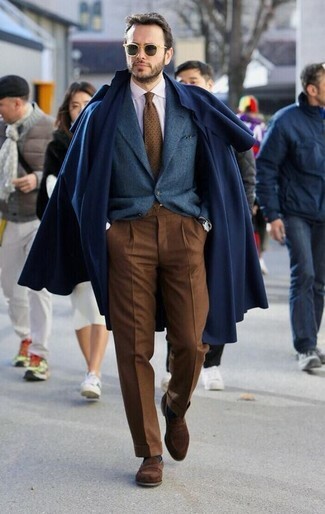 For a casually elegant look, go for an Ermenegildo Zegna Single Breasted Coat and light blue jeans — these two pieces fit really good together. Rock a pair of brown suede desert boots to make the ensemble more current. 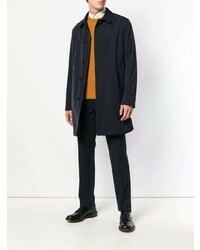 For a nothing less than incredibly stylish ensemble, go for an Ermenegildo Zegna Single Breasted Coat and charcoal wool dress pants. 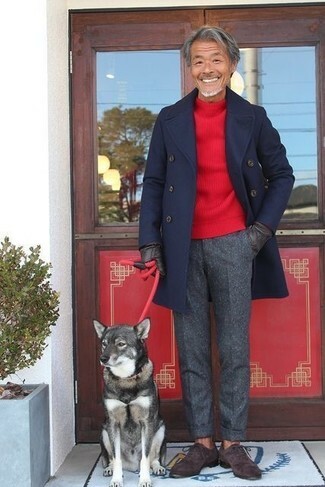 For something more on the daring side to complement this outfit, choose a pair of brown suede desert boots.